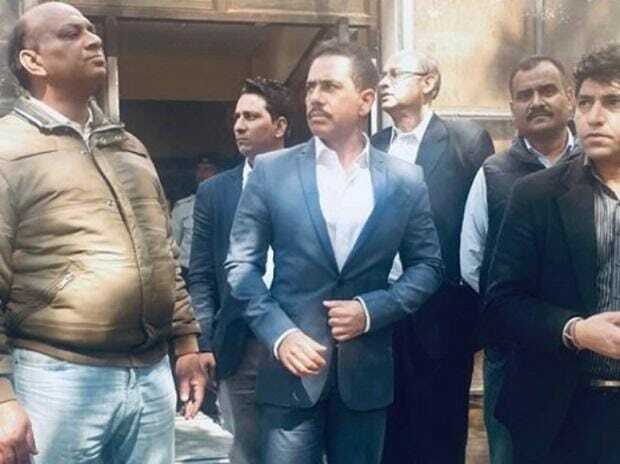 A Delhi court on Tuesday extended Robert Vadra's interim protection from arrest till March 25 in a money laundering case and asked him to join the probe after the ED alleged that he was not cooperating and sought his custodial interrogation. "If he is granted a blanket protection of bail, there is all likelihood that he will tamper with the evidence and would influence witnesses," it said. ED further said that Vadra had in a "mala fide" manner raised certain grounds claiming to be a "victim of a political vendetta" and harassment at the hands of the agency. "The allegations were totally unfounded and devoid of any merits. The investigation, in compliance with the procedure established by law, has been conducted as per the evidence on record disclosing commission of grave economic offences," it said. The probe agency also said that Vadra cited his firm's cooperation in another case as a ground for him being granted anticipatory bail. "It (other case) has no bearing on the present case. The present case is based on an independent set of transactions, initiated on the basis of commission of offences under the Black Money Act. The investigation pertains to the undisclosed foreign assets and entities to evade tax," it said. ED further said that it was unfortunate that he has got involved in a "political mud-slinging" but his conduct during the course of investigation raised even more apprehensions that he was a key link to unearth the modus operandi adopted by all the accused persons and hence the agency be given a free hand to interrogate him. "There are ample evidences in the form of E mails retrieved from seized electronic devices as well as material information gathered from electronic surveillance showing involvement of Vadra, along with his associates in undisclosed overseas assets which he, during course of investigation has denied blatantly taking advantage of interim protection. "From the investigation conducted so far, it is revealed that he is involved in the commission of the offence of cross border and domestic money laundering. He is the beneficial owner of various properties under the investigation in the case, which have been acquired through the proceeds of crime," the agency said. In his anticipatory bail plea, Vadra alleged that he was being subjected to "unwarranted, unjustified and malicious criminal prosecution which on the face of it is completely politically motivated and is being carried out for reasons other than those prescribed under law". It said Vadra's office was raided by the ED on December 7, 2018 and, therefore, he seriously apprehends that his liberty may be curtailed by the investigating agency. "It is stated that the petitioner's (Vadra's) firm through its authorised representative Manoj Arora has already joined investigation with the ED conducting investigation into the affairs of the firm in Rajasthan with their offices at Jaipur on many occasions and has supplied all the relevant documents to the satisfaction of the officials of the ED," the plea said.